The ideal blood pressure is 120/80. The top or first number refers to systolic pressure, which gets created in your arteries as blood pumps through with each heartbeat, and diastolic pressure, which refers to pressure in your arteries when the heart is resting between beats. If your blood pressure is less than 90/60 you have low blood pressure or hypotension. Blood pressure naturally varies throughout the day, but begins to climb as soon as you wake in the morning and gets lower at night with rest. Some people who have low blood pressure have no symptoms and may have low blood pressure throughout their lives with no concern. For others, low blood pressure or a sudden drop in blood pressure can affect blood flow to the brain and cause dizziness, fainting and other symptoms. The risk of hypotension generally increases with age and is more common in the elderly. 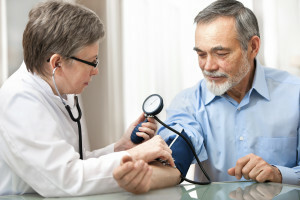 [H3] What are the types of low blood pressure and what causes it? Postural hypotension – This is low blood pressure caused by sitting or standing too quickly. It may also be caused by dehydration, pregnancy, not eating enough, or even eating a meal heavy in carbohydrates. Certain medications, including beta-blockers, ACE inhibitors, antidepressants and drugs used to treat Parkinson disease, can also cause hypotension. Postural hypotension can also be linked to alcoholism, anemia (vitamin B-12 and folic acid deficiency), and disorders of the central nervous system. Neurally mediated hypotension – This type of low blood pressure, also referred to as vasovagal syncope or the fainting reflex, comes from standing for long periods of time, which causes blood to pool in the legs and ankles and lack of flow to the heart, brain and other organs. It may also result from an overly stressful or emotional event. The fainting occurs due to a lack of communication between the brain and the heart. Low blood pressure may also occur as a result of a rare, autonomic nervous system disorder called Shy-Drager syndrome. Women who are pregnant may also have lower blood pressure during the first 24 weeks of pregnancy due to hormonal changes affecting the blood vessels and circulatory system. If you or a loved one experiences a sudden drop in blood pressure, please call 911 right away. [H3] What are the symptoms of low blood pressure and how is it diagnosed? Some people with low blood pressure also show signs of fatigue and depression. Depending on the results of your tests, your treatment may include a combination of diet and lifestyle changes, such as drinking more water and increasing your sodium intake, along with certain medications that may help boost blood volume.